EBJI » Annie Wins Bronze at Samoa World Cup! You are Here:EBJI >> News >> Annie Wins Bronze at Samoa World Cup! Annie Wins Bronze at Samoa World Cup! Comments Off on Annie Wins Bronze at Samoa World Cup! 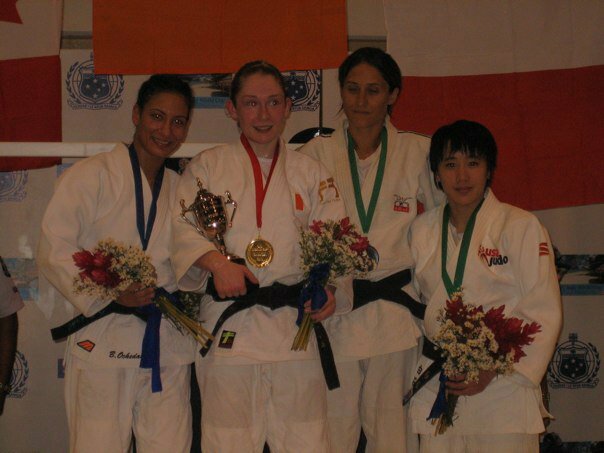 Annie Shiraishi went 1-1 at the Samoa World Cup November 13, 2010 to earn a bronze medal in the women’s 48 kilogram category. Shiraishi faced Canadian opponent, Bianca Ockedahl in the first round, whom she had beaten at the recent El Salvador World Cup. The match was tied with 30 seconds to go when Shiraishi attempted to counter Ockedahl and threw herself onto her own back for a wazari score. With only 30 seconds left in the match, Shiraishi was forced to chase Ockedahl, and was thrown for another wazari in the final seconds. After her first round defeat, Shiraishi fought for the bronze medal against an opponent from New Zealand. The match ended within the first exchange, when they went to the ground and Shiraishi arm-locked her opponent for ippon. This is her 2nd medal at a World Cup this year. She earns valuable points on the International Judo Federation’s world ranking list, which will determine the athletes who will participate in the 2012 Olympic Games.